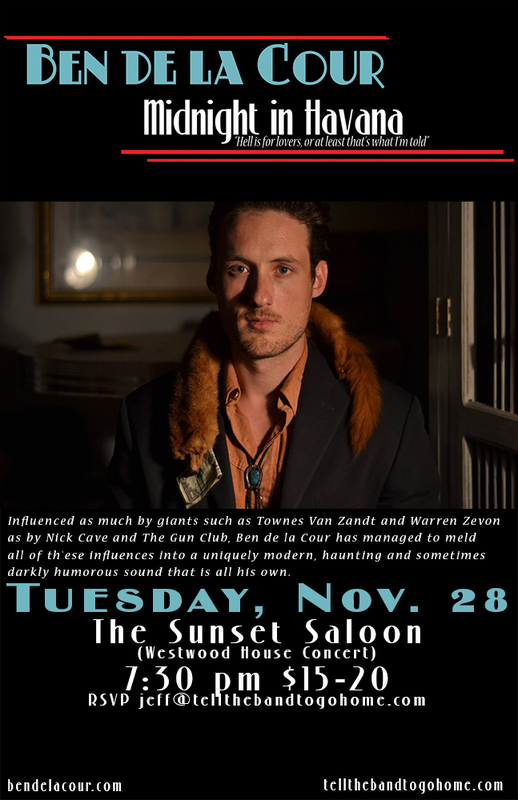 Home→Blog→News→Ben de la Cour at The Sunset Saloon, Tuesday, November 28, 2017! Ben de la Cour at The Sunset Saloon, Tuesday, November 28, 2017! The Sunset Saloon is a house concert venue in Westwood (near the YMCA on Portage.) We’re open to all. Feel free to pass along the event info, bring friends, bring your kids (our kids will thank you), or just come by yourself and make some new friends! Admission is by donation, which goes directly to the artists. Most folks pay $20, but any hard-working musician wouldn’t turn down more and will take whatever is comfortable for you to give. I get requests all the time from people wanting to play at The Sunset Saloon. Most of them, especially artists that are completely new & unknown to me (and presumably everyone else in town) get turned down. But this one came from a reliable source, Sunset Saloon mainstay, Brock Zeman. He knows what I like, and when he first came across Ben de la Cour in Nashville, he knew that this guy was something special, and knew that we’d be interested. One of the best albums I’ve heard from 2016 and high praise from Brock Zeman? Sold! We’re really looking forward to this one! Ben de la Cour has lived a different kind of life. After growing up in Brooklyn, he set out to see the world as an amateur boxer, bartender, janitor and agricultural worker in Havana, London, Los Angeles and New Orleans before settling in Nashville. Influenced as much by giants such as Townes Van Zandt and Warren Zevon as by Nick Cave and The Gun Club, Ben de la Cour has managed to meld all of these influences into a uniquely modern, haunting and sometimes darkly humorous sound that is all his own. In 2016 Ben de la Cour won the prestigious Kerrville New Folk Competition and released ‘Midnight in Havana’, eleven tightly crafted songs of what he refers to as “Americanoir”. Tales of substance abuse, murder and mental illness sit in perfect juxtaposition with occasional moments of playful lightheartedness and the ever-present glimmer of hope. However, upon closer inspection, darkness almost always wins…an unlikely hero, but one that suits de la Cour.